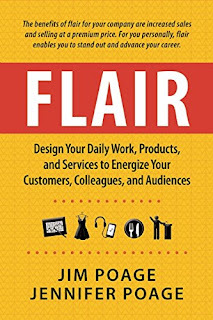 Flair, by Jim and Jennifer Poage, focuses on teaching us how to do work that excites the world. With real-life examples and anecdotes, the book tells us how to master the skill of rendering unforgetable services and creating products that stirs up positive emotions. Using Dr Dre's Beats headphones, Reebok jerseys, The Magic Castle Hotel (Hollywood) as examples among others, Flair gives us a glimpse of what creators considers as the essence of their creation as well as what effective flair looks and feels like. Story - Tell a story about your offering. Entertainment - Have your offering entertain your customers. Experience - Create pleasant, even happy, customer experience. Sincerity - Construct flair to accurately reflect your offering. Excellence - Be sure your offering is high quality so it doesn't disappoint. Energy - Strive to energize your customers. Flair, by Jim and Jennifer Poage, doesn't try to pretend it has "the secret formula" for creating the next great product or service. Rather it makes a clear disclaimer, saying that creating great products or services that resonates with people is a matter of taste; and what energises some people may be repulsive to some. Also the book explains that creating flair isn't exactly a science (if it is, everyone would be doing it), but incorporating the above elements can take us closer to our goal. Flair isn't too difficult to read. It is well-researched and the real-life examples given helps buttress the book's argument that flair can be learned. If you are looking to energise your work and raise your game, then this book might be a book for you. Many thanks to Maven House for review copy.